This guide is about the Nintendo GameCube game. For the Game Boy Advance game released in Europe as Mario Power Tennis, see Mario Tennis: Power Tour. Mario Power Tennis, known in Japan as Mario Tennis GC (マリオテニスGC, Mario Tennis GC? ), is a tennis game released for the Nintendo GameCube in 2005. It is the sequel of the popular Nintendo 64 game Mario Tennis. New features introduced in this game include Power Shots, which can be used to fire a strong, almost unstoppable shot at an opponent, or reach an otherwise impossible ball. It also has new courts, with features such as Klaptraps, Ghosts, and other enemies from the Mario series appearing to add to the challenge. The game was re-released for the Wii in 2009, under the 'New Play Control!' banner. This version adds the ability to use the Wii remote to swing the racket, in a style similar to that of Wii Sports. 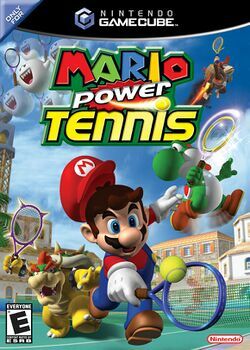 Power Tennis features 18 playable characters, all of whom derive from the Mario franchise. Many characters, such as Wario, had already appeared in the game's predecessor and several other Mario spin-offs, while this was the first appearance for Wiggler as a playable character. All of the characters are categorised into six groups that reflect their playing style. Mario Power Tennis features variations of tennis matches consisting of characters, courts, and scenarios based on the Mario series. The range of courts includes the standard three types of tennis court, but consists predominantly of those themed upon games in the Mario series, known as "Gimmick" courts. As well as adopting the style aesthetically, these feature thematic elements that influence how the match will be played on that surface. Although standard tennis is available, variants of the sport can be played which adopt different rules and methods of victory. The central mode of the game is "Tournament Mode", which comprises a set of events with accumulating difficulty. These set of events must be finished successfully to unlock playable characters. This mode can be completed either in "doubles" or "singles", and is divided into Gimmick courts and standard courts. This page was last edited on 9 June 2014, at 01:23.